Perfect for applications with raised floors that require AV and power in one box. connectors and large cable radii. These boxes handle that and more! Carpet inlay and flat covers available. 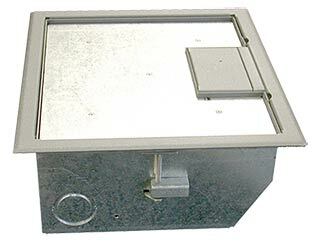 The back boxes are available in 4.5” depth, and are constructed of 14-gauge steel. The “Q” model is the larger version and accepts standard single gang, 2-gang and 3- gang plates. A 4-gang bracket (with 3 dividers) is available for applications requiring a four gang plate. and 1-gang of low voltage compartments. Covers and carpet trims are available in gray, black and clay. If your application requires a custom color, Clark will be happy to quote on your specific requirements. You have a choice of covers with the RFL-AV Series. If you are using carpeting, select the dual door or single door covers. If you have a floor where you don’t want to insert the carpet on the top of the box, select the solid cover door. Covers are available in solid lid for stage or tile floors and standard single or double door for carpet. A sampling of covers in standard colors shown below. Contact Clark to find the one to fit your needs.